Siri can read your text messages to you in a human-like voice, and you can even respond to them using your voice, too. Now that’s hands-free. After the short chime, you can give Siri a command. You can make the same request a number of different ways. “Do I have any messages?” works just great. Siri announces how many messages you have waiting for you. Siri then starts reading all new messages to you, beginning with the sender’s name — or if the name is unknown, the phone number it’s coming from. You won’t see the message on the screen. 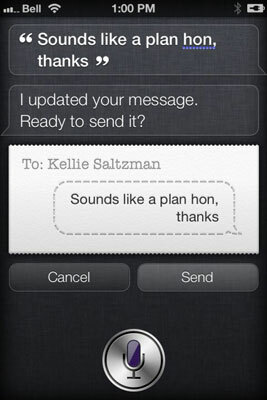 Siri performs the action requested. 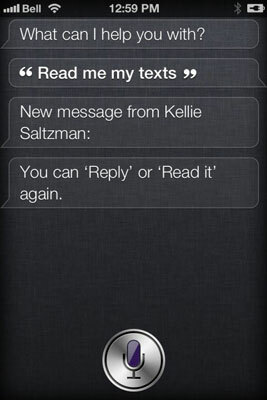 Keep in mind that Siri will read only those text messages that you haven’t picked up yet. If you’ve got a bunch of messages stored on your phone but you’ve already read and/or replied to them, Siri will tell you there isn’t anything to read to you.